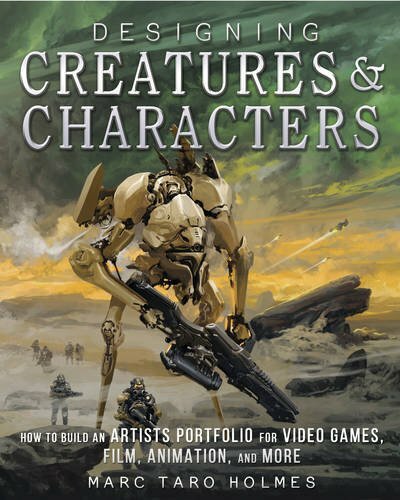 Designing Creatures and Characters is a book targeted at concept artists who want to improve their skills at drawing creatures and characters. This 192-page paperback is packed with lots of tips and exercises designed to challenge your thinking and help you with your process. Marc Taro Holmes is an art director, concept artist and a regular urban sketcher. He's in the industry so he's able to give insider tips on what it takes to be a concept artist, and how to work with others in a team to provide cohesive design. There are 35 projects that are split into different skill levels. Each one involves designing some character or creature. There's a brief, some instructions, guidelines and explanation on why certain things are done this way, and the mentality you need to approach projects. The projects are varied and detailed It's not just about drawing something that looks nice. It actually goes into depth, such as studying anatomy to make sure that it makes sense for your creature to move, so that when it's actually used in games or animation, it would make sense. So it's not just about drawing, it's deeper than that. It involves thinking about how things work, the rationale. Like a person won't wear such a huge headgear when turning the head would break the neck. So if you're into some intensive training to refine your concept art skills to draw creatures and characters, this is the book to get.